Andy Cadman Persian Turquoise Cluster Bracelet size 7"
Born in 1966, Andy Cadman is the older brother of well-known silversmith Darrel Cadman and a half-brother of renowned smiths Gary and Sunshine Reeves. This group of relatively young smiths (35 to 40 years old) all learned much of their trade from David Reeves (Gary and Sunshine's full-brother who is now deceased). The Cadman brothers and the Reeves brothers, therefore, share a common element of apprenticeship and exhibit certain similarities in their work. Andy is a jovial big bear of a fellow and his friends and family call him "Ben." Made with gorgeous natural, untreated "Persian Blue" turquoise, this cluster of stones is set in perfect symmetry on a deep-stamped, sculpted-edge cuff. The center oval in this grouping shows an archetypal, high-domed Persian cut and all the stones show a continuity of vivid blue coloration which only enhances this striking design. Each of the twenty-one ovals is set in a straight-edged bezel and raindrops are interspersed between the stone sets around the edge of the cluster. This stone was sourced through Armenian gem dealers in New York in the mid-1970's and has been locked away in a vault in New Mexico for thirty years. This piece is one of several made from a stash which the dog sniffed out and which we subsequently cleaned out. This is the original pierre turquoise (Turkish stone) of legend (see note at bottom of page). It is truly as blue as the photos indicate. Like all of our photos, this was shot outdoors with the full spectrum of natural light and the photos are not re-touched. The cuff has an undulating scalloped edge and shows the deep, precise stampwork for which Andy is well-known. 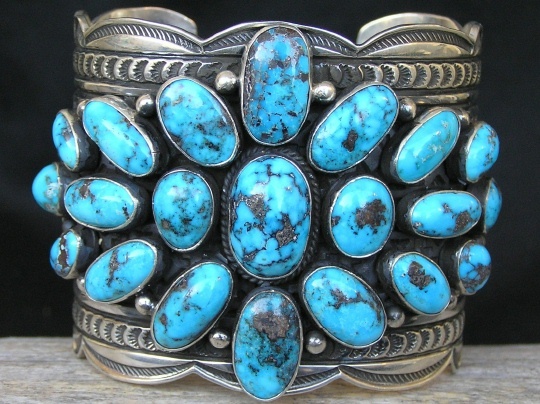 This is a classic wide Navajo cuff hybridized by rare turquoise of exceptional color. The confluence of legendary turquoise with traditional Navajo silversmithing is a marriage made in heaven. Hallmarked "A. CADMAN" and stamped "Sterling" inside the cuff behind the stones. Stones: center oval 3/4" x 1/2"; top & bottom ovals 11/16" x 7/16"; eighteen ovals ranging from 7/16" x 1/4" to 1/2" x 3/8" to 5/8" x 5/16"
Overall dimensions of cluster: 4 1/4" x 2 5/16"
Width of cuff: 2 5/16"
Terminal to terminal: 5 7/8" Gap: 1 1/8"
Total inside circumference (including gap): 7"
Note on Persian Turquoise: We can add little to the Wikipedia turquoise listing which includes several references to Persian turquoise. In short, Persian turquoise is almost certainly the earliest mined turquoise, perhaps mined as early as 5500 B.C. It probably came to be called turquoise because 16th century Venetian traders bought it at Turkish bazaars and imported it to Europe. For centuries, Persian turquoise continued to come to Europe and the rest of the Occident through Turkey. In the United States, it was most often sold by Armenians of Turkish origin; some residing in Los Angeles, others in New York. The stones in this piece were sourced from Armenians in New York in the mid-seventies, while the Persian stones in Ida Peyton's earrings (see below) were sourced from Armenians in L.A. (also in the mid-70's). This stone was mined in Iran in the last few years of the reign of Shah Mohammed Reza Pahlavi. The subsequent overthrow of the Shah by a movement led by Ayatollah Ruhollah Khomeini and the Shah's flight to New York (to receive cancer treatment at Sloan-Kettering) resulted in the taking of the Amerian hostages at the U.S. Embassy. Since the Hostage Crisis, the U.S. has maintained a trade embargo against Iran and current relations between the two countries have reached a nadir which will only be exceeded by tomorrow's dawning sun. Personally, I'm not expecting to see Persian turquoise legally imported to the U.S. again in my lifetime. This is legally imported turquoise used in this piece and very little of it remains in the United States.